Kindergarten Math Outside Games Get Kids Moving And Learning Math. What a great idea! Why not have the kids utilize their energy while they learn math. Kindergarten math outside games will give a child the best of both worlds. Having fun and being a kid, while they are learning math. Preparation: First be sure to inflate the beach ball. This game can be used played using addition, subtraction, multiplication, or division facts. With the permanent marker, write the numbers 0 through 10 all over the ball. Each of the numbers can and should be written more than once on the ball. How to Play: You can play the game with one or more students at a time. 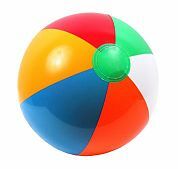 Toss the beach ball to student. You should stand at a reasonable distance from the student so the ball reaches them on the fly. The player catches the ball and keeps his or her hands in the same place after making the catch. After catching the ball, the student looks to see what numbers on the beach ball their thumbs are touching. 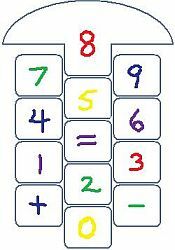 These are the two numbers that they will add together. They should be given a time set by you to answer the question. Have Fun! If you liked Beach Ball Math, you'll probably enjoy more kindergarten outdoor math games like this next one below. Helping kids can get a little exercise with a fun math learning twist. Do the Math Hopscotch: Great active math game for teaching addition and subtraction facts. Grab your colored chalk, head outside, and get ready for some outside math fun!